Kenny McLean believes recent international recognition can provide the sort of inspiration needed to help Aberdeen’s players achieve domestic success this season. The Dons midfielder is convinced the Pittodrie club’s chances of a first league title in 31 years have been boosted by the number of players earning caps for their respective countries lately. Last Thursday McLean himself became the first Aberdeen player to start a game for Scotland since Lee Miller was picked to face Japan all of seven years ago. His debut in the win against Czech Republic came in the same week team-mates Simon Church, Niall McGinn and Jonny Hayes were also on international duty. Church scored for Wales in their draw against Northern Ireland while McGinn won his 39th cap for Michael O’Neill’s side in Monday’s 1-0 victory against Slovenia. Hayes picked up his first two caps for the Republic of Ireland in the Dublin double header against Switzerland and Slovakia as all three boosted their hopes of making it to Euro 2016.
point lead at the top of the Premiership. He said: “There’s usually only one or two picked but it’s great we’ve got so many just now and it shows we’re getting the recognition. “It has a knock-on effect because it will make those who aren’t involved hungry to get in the squads. You could see at training on Wednesday the genuine happiness for the boys who were returning from international duty. “We’re a really close group with everyone behind each other and everyone was congratulating us. It was great to see how happy people were for us. “There is no doubt it can give us a boost for the remaining league games. The boys returning from international duty have that wee bit of confidence and spring in their step after getting game time for their country. “We had a taste of the good time and now it’s back to Aberdeen. It’s because of what we’ve done at club level that we got picked for our countries. “Individual and team performances have been great and international managers have noticed that. “We enjoyed it but it’s gone and we need to work hard to get in the next squads. I’d like a big finish to the season to try to do that as it’s only the start for me, I need to work hard and I’m more determined than ever right now. Aberdeen’s title hopes suffered a serious setback when they lost the last match before the international break 2-1 at Motherwell on a day when veteran midfielder Barry Robson was sent off. That left Celtic four points clear at the top with a game in hand and the defending champions could extend it to seven before the Dons play Hamilton on Sunday. Despite that McLean has warned the Pittodrie club’s bid for the title is far from over as the team that started the season with eight straight wins are determined to end it with seven-in-a-row. He added:”We’ve got the mentality that we know we can win every game from now until the end of the season. 21 points. It would be ideal to win the remaining seven games and we’ve got the quality in the squad. “It’s about taking it game by game. I hope there’s more twists and turns. Points will be dropped along the way – I just hope it’s not us. “If there’s slip-ups along the way I hope we can capitalise. We’ve shown twice at Pittodrie this season that we can beat Celtic and we’ll deal with that game when it comes around. 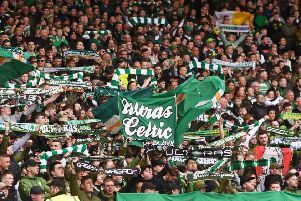 “It can be tough when Celtic play first but we just look after ourselves. l Kenny McLean was speaking at the Tesco Bank Football Festival at St Machar Academy in Aberdeen. Over 100,000 children have now taken part in the grassroots school’s programme.